Canada’s Most Versatile Person? | TV, eh? On Sunday, 656 000 Canadians tuned in to CBC to watch a 2-hour special designed to unveil Canada’s Smartest Person. Hosted by comedian and Mr. D star Gerry Dee, it focused on the theory of multiple intelligences pioneered by Dr. Howard Gardner, a psychologist and professor of Cognition and Education at Harvard University. The show used 10 challenges to explore six areas of intelligence: logical, linguistic, musical, visual, physical and interpersonal. Audiences could download an app to play along and see how they stacked up against some of Canada’s biggest brains. I interviewed three of the competitors about their experiences, including the importance of Gloria Gaynor and beer pong. 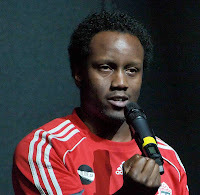 Toronto’s Greg Frankson is a spoken word performance artist, arts educator and mental health advocate. Winnipeg’s Marshall Carroll is a high school science teacher and stand-up comedian, educated as a theoretical quantum chemist. 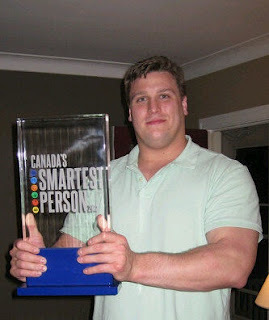 The champion was Hamilton’s Peter Dyakowski, a Mensa certified offensive linesman for the Hamilton Tiger-Cats. Peter: It was pretty rigorous. It started with an online application and tests, moved on to phone interviews and evaluations, and finally I made it through to a round of live testing via Skype. I got through that and made it into the final. Greg: Seeing the daunting application form was a shock, but I got through it all and then received a message letting me know I’d moved on in the contest. Marshall: There were many steps. Skill inventories and other challenges were all components of the selection process. I was extremely excited when Media Headquarters told me that I had made the final four out of thousands of applicants. Greg: There were many stages to pass through, until some tall foreheads on the other end managed to whittle hundreds of applications down to the four of us Canada saw on TV last Sunday. Peter: It was definitely more than I thought I was getting in for. That’s quite an achievement in its own respect. The 17 hour taping must have been even more arduous. What was the most challenging part? Greg: The most challenging part for me was maintaining energy and focus. I’m a bit of an energy radiator, which is great when you have an hour-long performance ahead of you, but isn’t such an asset when you have a day-long television shoot. Managing my energy levels (especially without coffee, which I was avoiding all day for strategic reasons) was the ongoing battle. I think I did alright with it, but it was tough at points. Marshall: That darn cup stacking! I have 11 years of University education, but I should have gone to more frat parties to improve my cup stacking and beer pong skills. Yes! Twitter was abuzz with viewers cheering for their favorite contestant, taking the challenges themselves, as well as (you guessed it) debating the merits of cup stacking as a future Olympic sport. Which part of the show stands out as a favorite moment for you? Greg: My favorite part of the taping was all the laughter of the “hurry up and wait” backstage. During those times we were encouraged to stay in our own competitive bubbles and while we did do some of that, I’m sure the producers were a little disappointed in how much goofing around, amicable chatting, and outright tomfoolery the four of us were getting ourselves into while we waited between shoots. Marshall: Greg slamming a great poem, and me doing a bit of stand-up comedy for the studio audience were also highlights. At one point, all of us got giddy. Peter, Laura, Greg and I sang and danced to ‘I Will Survive’! Peter: …And getting to meet Gerry Dee, he’s pretty entertaining. Greg: I had a blast with Marshall, Laura and Peter and I’m glad to say we’re all friends and have been keeping in touch. What does “smart” mean to you? 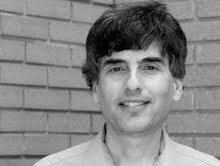 Greg: Understanding that it’s the totality of one’s interactions with the world (and not just their academic prowess) that determines a person’s true smarts is a big leap forward in my view. Marshall: Making a decision that will benefit all. Peter, do you think your athletic career might have been an asset for your performance? Peter: It definitely helped me to perform under pressure. That might have actually given me an unfair advantage. I am used to having to make decisions in a stressful environment. You’ve sparked a lot of discussion about how offensive linesman have to be smart to react quickly to multiple variables in a game. What does winning Canada’s Smartest Person mean to you? Peter: It’s definitely a lot of fun. I take it with a grain of salt but I fully intend to be terribly obnoxious with it. Winning was also a big boost to the confidence since I was worried about what tens of thousands of hits to the head were doing to my mind! Do you think Canada’s Smartest Person can be considered to challenge societal stereotypes? Peter: Certainly. There are always examples of smart athletes who challenge the stereotype of the dumb jock. This just adds to that. Marshall: More value should be placed on intelligence. We should emphasize that being intelligent is cool. There is a cornucopia of intelligences, as CSP displayed. Trying our best is a key to intelligence, regardless the variety. Greg: Kudos to the producers of the show for moving the conversation forward in this regard.